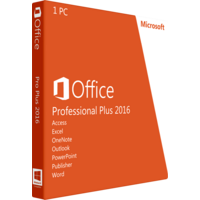 Microsoft Office Professional Plus 2016 is one of the latest releases of standard software by Microsoft developed for simple and efficient creation of standard documents for studying, business and personal development. The Plus 2016 versions is created with extreme flexibility in mind for simpler collaboration and communication of team. The upgraded products offer new features and improved and advanced standard applications. Great compatibility – the 2016 Plus Office is developed with great flexibility and accessibility in mind for you to get the same experience no matter which device you use for work – smartphone, laptop, desktop PC or tablet. Now all the products from the pack of Microsoft Office Professional Plus 2016 are optimized to the screen resolutions. Enhanced collaboration – new Office Plus 2016 is specifically developed for collaboration and cooperation of a team on a single project. Every product supports simultaneous work on the documents as well as co-authoring features, simplified sharing and shared notebooks. Moreover collaboration is possible even in case your team access the project from various devices. Advanced sharing – now all the components of Microsoft Office Professional Plus 2016 feature sharing options right within the documents and projects. This means you do not need to export your projects to share them online. Share option also allows you to see who of your team has access to a shared project, whom you can assign access, who is instantly working on the document as well as restrict access and manage permissions for every single document you work on. Notebook sharing – is another advanced feature distinguishing Microsoft Office Professional Plus 2016 from other products of the type. OneNote allows you to gather all the necessary pieces and snaps of information as photos, drawings, web pages, videos, etc in a single location and share your updates with other people. This option sufficiently improves studying and collaboration processes simplifying communicating routine information among users. The application now simply generates a link to a piece of information you want to share. You can choose people from your contact list to share the link with as well as type a short message to explain the piece of information shared. Smart Lookup is a great option to find necessary information on the web. Initiate search for articles, images, tutorials, videos and other data right in your documents. The feature works in the simplest way. Just highlight a word or a phrase you want and initiate search to add data on the concept from the web. One click forecasting – this option allows you to quickly analyze your data and to turn them into forecasting of future trends. Every forecast is created in a new spreadsheet of Excel containing a table with historical and predicted values.